The Vancouver Condo Buzz » REGISTER TODAY! Luxury Vancouver SHANNON WALL CENTRE KERRISDALE Condos & Townhomes at 57th & Adera at Granville Street > Amazing Shannon Wall Centre Vancouver Westside Real Estate! « SALES CENTRE opens Feb 2013! 3 CIVIC PLAZA Surrey Landmark Condo-Hotel Tower > 50 Stories connected to Surrey Central SkyTrain Station > Invest in your future … Surrey’s Urban Future is Here! REGISTER TODAY! Luxury Vancouver SHANNON WALL CENTRE KERRISDALE Condos & Townhomes at 57th & Adera at Granville Street > Amazing Shannon Wall Centre Vancouver Westside Real Estate! The Phase 1 launch of the exciting new Vancouver Shannon Wall Centre Kerrisdale condos and townhomes is coming early 2013! Register today for more information! Marketed as Westside Vancouver real estate’s “last great family estate”, the Shannon Wall Centre Kerrisdale Vancouver luxury homes for sale provides the type of lifestyle that was once only reserved for the privileged few. Now, they are made available to a select number of lucky home buyers. The Westside Vancouver Shannon Wall Centre Kerrisdale luxury homes are located at 57th and Adera at Granville and the presales Vancouver Shannon presentation show room will be situated at 7165 Granville Street Vancouver. The developer, which is always key to the success or failure of a new project, is highly touted and award winning Wall Financial Corporation. They are one of our most favourite builders in the local market and have a long line of successful projects and happy home owners. The Shannon Wall Centre Kerrisdale Vancouver luxury homes will be designed through the collaboration between Perkins + Wills Architecture and Robert Lemon Architect Inc. The garden restoration design and contemporary landscape architecture is by Durante Kreuk. The Vancouver Shannon Estate is simply amazing and consists of a total of 10 acres. The first phase of Shannon Wall Centre Kerrisdale Vancouver Westside real estate development will be built along Granville street and consist of 5 acres of the 10 acres total plot size. Construction is starting right now with presales also beginning in January 2013! The historic Coach House at Shannon Wall Centre Kerrisdale is a singular building now completely redesigned and lovingly restored for modern day living. NOW SELLING > Limited opportunities remain at the Cartier House and Churchill House featuring Shannon Townhomes from $1,204,900 (floor plans are online) as well as the JUST RELEASED Coach House at Shannon Vancouver featuring heritage estate homes from $1,100,000. 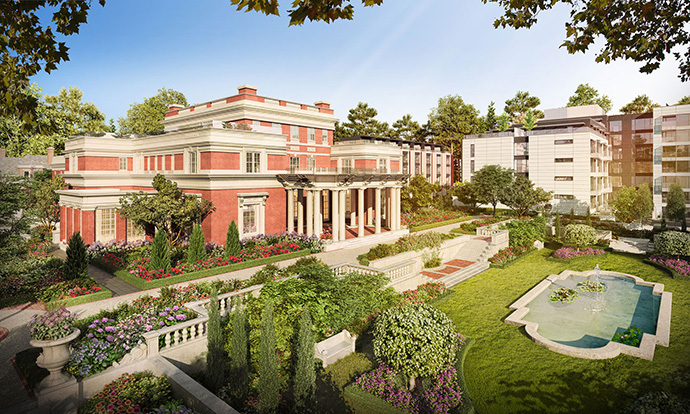 The on-site amenities at the Shannon Vancouver Kerrisdale property will include a formal garden, children’s play area and garden plots for residents. Also, there will be a large meeting and gathering room that is ideal for entertaining and relaxing. This is situated in The Mansion at the Shannon Vancouver Kerrisdale estate. In addition, there will be an outdoor heated lap pool as well as a fully equipped fitness centre. 1. The Shannon Wall Center Kerrisdale Cartier House > This is a 5 storey boutique low-rise building with 41 Westside Vancouver luxury condo residences that range from 1 to 3 bedroom layouts plus a few Cartier House Shannon townhomes. As well, the Wall Financial Corporation master plan also consists of a Shannon Vancouver rental condo building which is located in the south east corner of the project site. Phase 2 of Shannon Wall Centre Kerrisdale Vancouver will feature approximately 400 condos and possibly some two level townhomes as well. Phase One of the luxury Vancouver Shannon Residences is already under construction and is due for completion near the end of 2014. The maintenance/strata fees (approximate) have not yet been released by the developer, but more information can be asked through a realtor. Not much is published regarding the Shannon Vancouver luxury home details, but this is what we know. Please note that all sizes and prices are approximate and subject to change at any time. There will be a large selection of 1 bedroom to 2 bedroom condo floor plans in addition to town homes available in Phase 1. To be exact, there are 68 total homes available in Phase One of the luxury Vancouver Shannon condos and townhome project by Wall Group Financial. 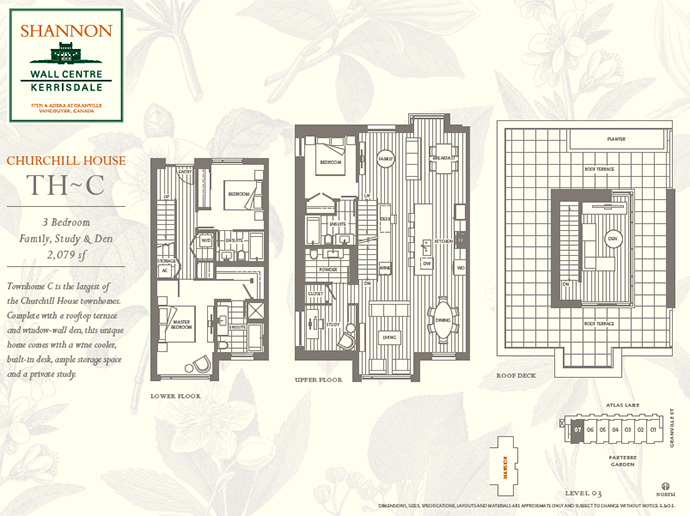 The 1 bedrooms at Shannon Vancouver luxury homes start from about 497 square feet and in the mid $300’s range (probably around the $360,000 price point) and the 1 bedroom and den layouts are starting from approximately 600 square feet with a price point starting from the mid $400’s. As well, the 2 bedrooms at the luxury Vancouver Shannon homes for sale will start from the mid 700 sqft range and probably from the mid to high $500’s in terms of pricing. Last but not least, the luxury Vancouver Shannon Town Homes will be multi-level (2 floors) and will be just over 1,000 square feet with starting price ranges in the mid to high $800k range. Again, all of these are approximate and estimated starting floor plan sizes and prices. More information coming online soon to www.shannonwallcentre.com. 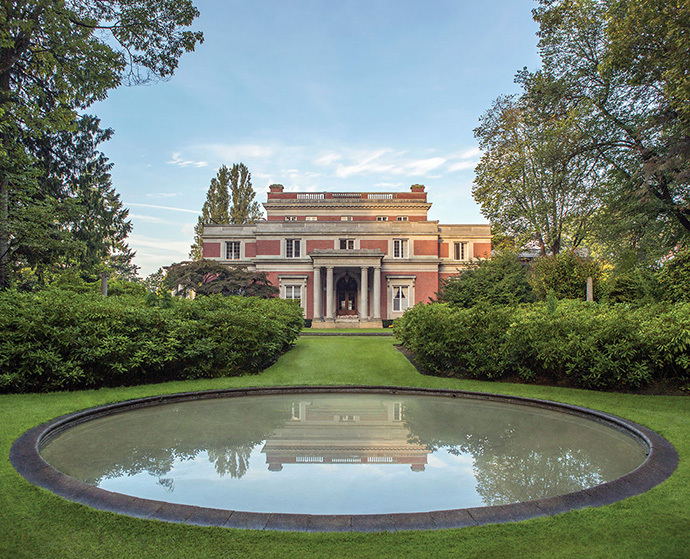 Offering 41 spectacular new Westside Vancouver homes for sale on the 10 acre historic development, the luxury Cartier House at Shannon Wall Centre will be both opulent and stylish. The living spaces are efficient and the floor plans great for entertaining and relaxing. Luxury home buyers at the The Cartier House at Shannon Vancouver Kerrisdale condos will have a choice between 2 colour schemes: LIGHT (oak) and DARK (graphite & wenge) and all homes will come with a Bosch washer and dryer. The bedrooms will have wood cut pile carpets and the living/dining, kitchen, flex, entrance, stairs and hallways will have a beautiful ultra wide engineered oak wood floor. The kitchens at the Wall Centre Shannon Cartier House condos will have beautifully engineered Euro cabinets, polished quartz counters and backsplashes, Julien stainless steel double bowl sink, Thermador dishwasher with wood front panelling, oven, gas cooktop, hood in addition to a Liebherr fridge with panelling. 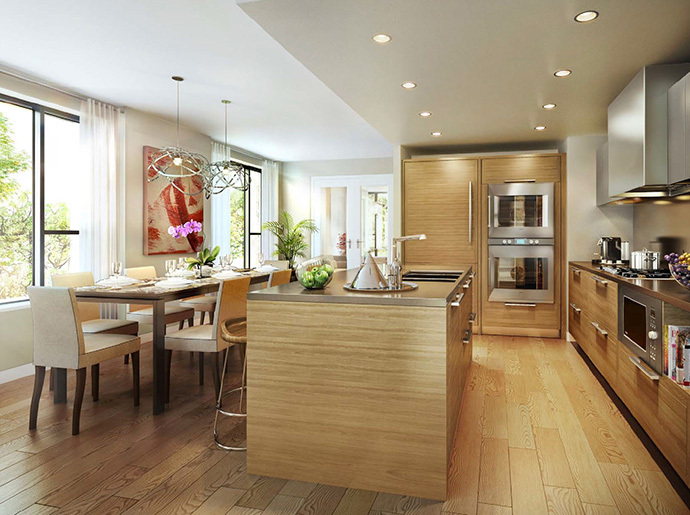 The Kerrisdale Vancouver Shannon Cartier House Townhomes will feature much the same finishes, but the appliances will include Gaggenau dish washer, fridge, double oven, gas cooktop and a Thermador range hood. All homes will have the premium Panasonic microwave. The fabulous bathrooms at The Cartier House at Shannon Vancouver Kerrisdale luxury homes include polished marble counters, marble tiled accents, polished ceramic tiled walls, streamlined glass surrounds in master ensuite showers, modern European Grohe faucets and fixtures, contemporary Duravit under counter vanity basin, deep Duravit soaker tub, wall mounted Duravit Stark 3 toilet and Nuheat electric floor heating system. 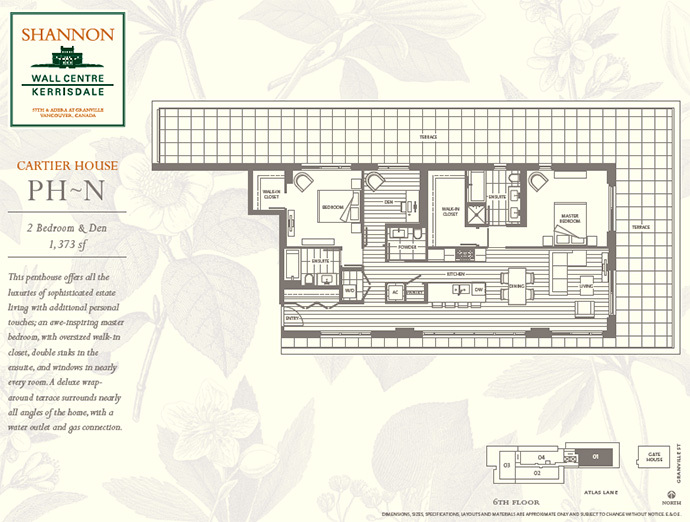 The Vancouver Shannon Cartier House Townhomes also have the added convenience of a powder room on the main floor. The Churchill House Townhomes at Shannon Wall Centre Vancouver features two great colour palettes that are different from the Cartier House condos and they include TRADITIONAL and DARK. Much like the above, most of the homes will have a gorgeous wide plank oak engineered wood flooring as well as wool cut pile carpets in the bedrooms. There are modern pot lights, directional halogen surface mounted lighting and recessed stairway lighting as well. The kitchens at these five new boutique Wall Centre Shannon Churchill House Townhomes will feature spectacular European cabinets, durable and polished quartz countertops, Gaggenau appliance set except for a Panasonic microwave and Thermador hood fan in addition to Grohe faucets and a Julien under mounted stainless steel sink. Some of the Churchill House Shannon Vancouver townhomes will also have wine fridges. The inspired bathrooms will feature opulent polished marble counters and tub apron, luxurious marbel tiled accents on ensuite and shower pans in addition to large format polished ceramic tile work. There are modern European Grohe faucets and fixtures in addition to Duravit deep soaker tub and under counter vanity basin. 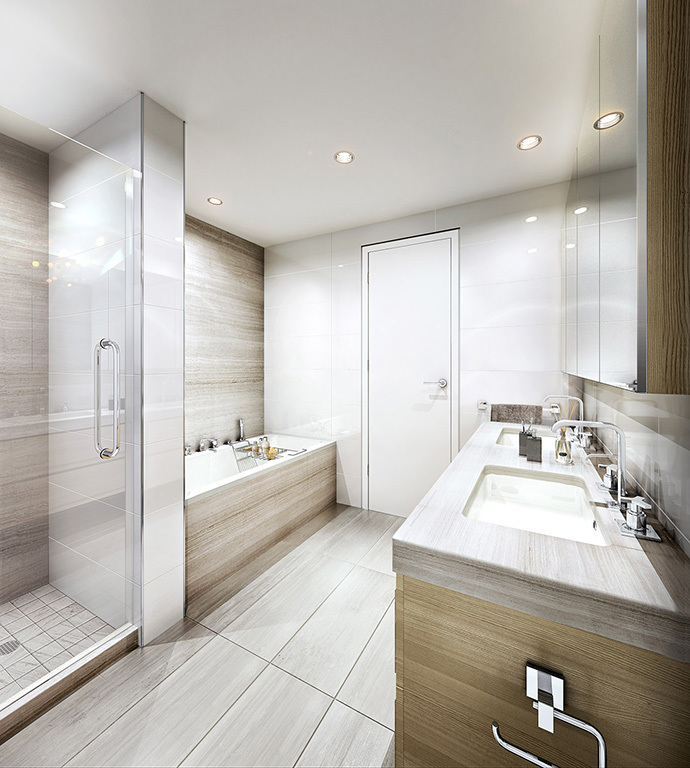 The Wall Centre Shannon Churchill House townhomes will also have wall mounted toilet by Duravit Stark 3 and a quality Geberit in wall tank and bowl carrier system with dual flush technology. The master bathrooms also have Nuheat in floor radiant heating. 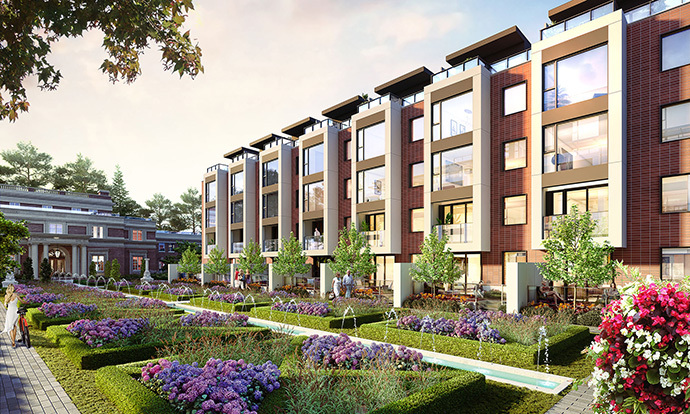 Nestled just off Granville street with a quick 10 minute drive to downtown Vancouver, the Kerrisdale Vancouver Shannon Mews condo project is ideally situated close to everything. Being in Westside Vancouver real estate’s most historic address, you will be living amongst old growth trees, quiet neighbourhoods and outdoor recreation. 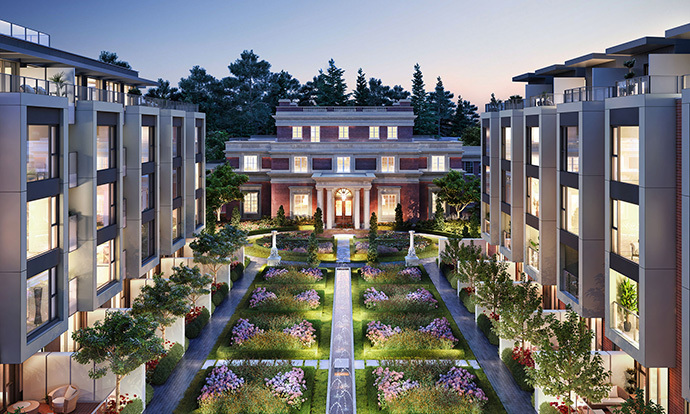 From YVR to UBC and from South Granville to Kerrisdale, the luxury Vancouver Shannon Mews project is one of the most highly sought after and most exciting new developments in the Westside Vancouver real estate market in 2013! Also close by are the Dunbar and Southlands neighbourhoods in addition to UBC’s Pacific Spirit Park and Van Dusen Botanical Gardens. Local services and amenities such as grocery stores, cafes, restaurants, boutique stores, big box retailers, banks and top ranked schools are also just minutes away. 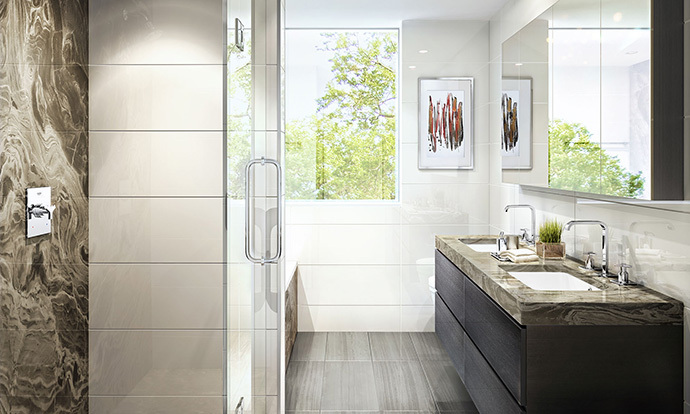 At the centre of is all is the Wall Centre Shannon Vancouver Westside homes, a collection of classically sophisticated Kerrisdale residences with its own sense of style that reflects your own. Wall Centre Kerrisdale Shannon Mews is set to release the first buildings at this Westside Vancouver real estate project location. The newest community brought to you by Wall Group Financial is called the Shannon Wall Centre Kerrisdale project and is situated at Adera and Granville Street Vancouver Westside real estate district. The developer of the new Vancouver Wall Centre Kerrisdale Shannon Mews project is the same builder as the highly successful Yaletown Park, Capitol Residences, Wall Centre False Creek, 2300 Kingsway, and of course Wall Centre. 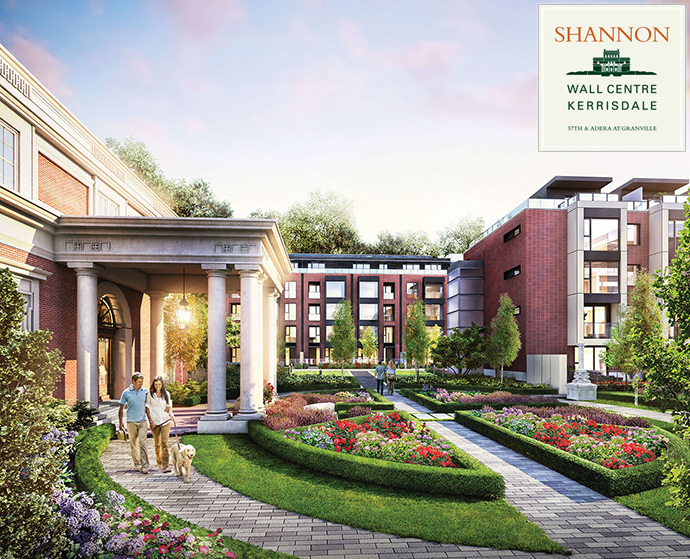 The original plans for the luxury Vancouver Wall Centre Kerrisdale Shannon Mews project was for over 400 homes consisting of both condominium residences and high end multi level townhouses.